The week called for only 2 days of nice weather, and I intended to make the most of them. 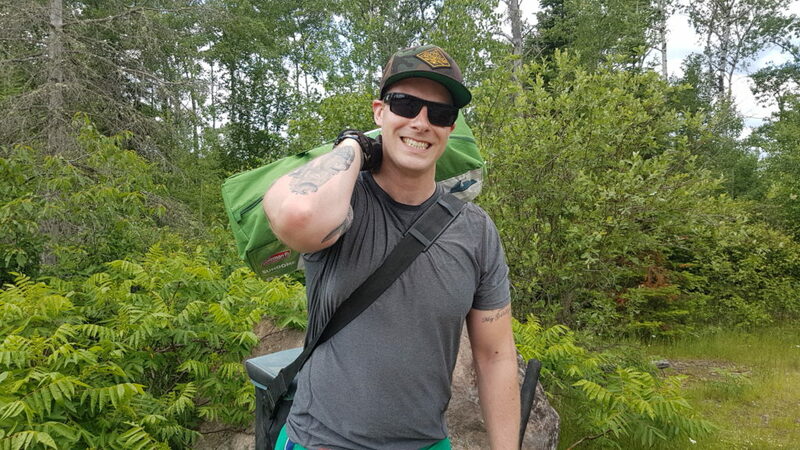 I enticed my friend Brendon to join me on an overnight camping trip to Horseshoe Lake, in the Whiteshell park. 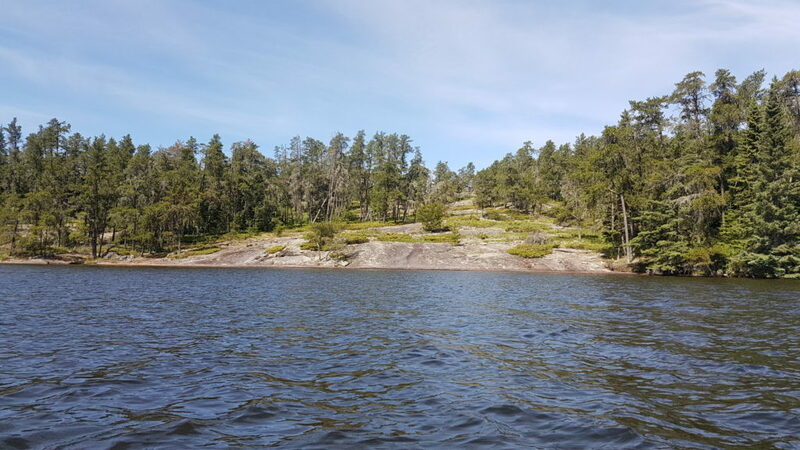 This lake is known for its smallmouth bass fishing, and we planned on taking advantage. Horseshoe lake is a mid-sized lake that I had never been to before. 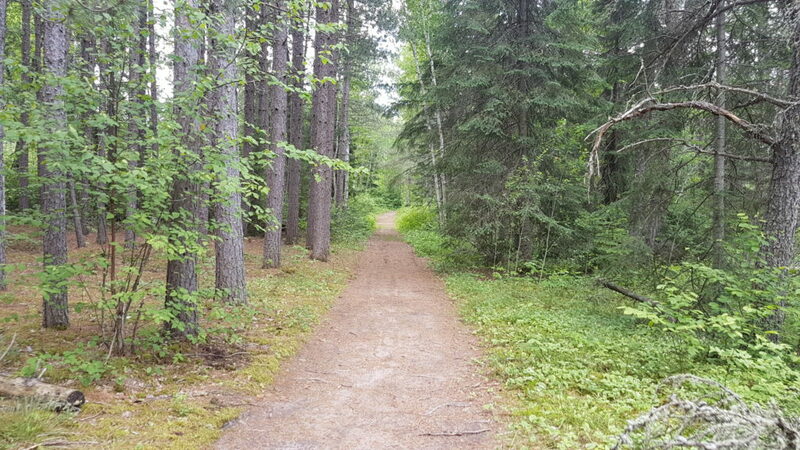 It is accessed via portage from a small lake called Meditation, which in turn is accessed via portage from the road. 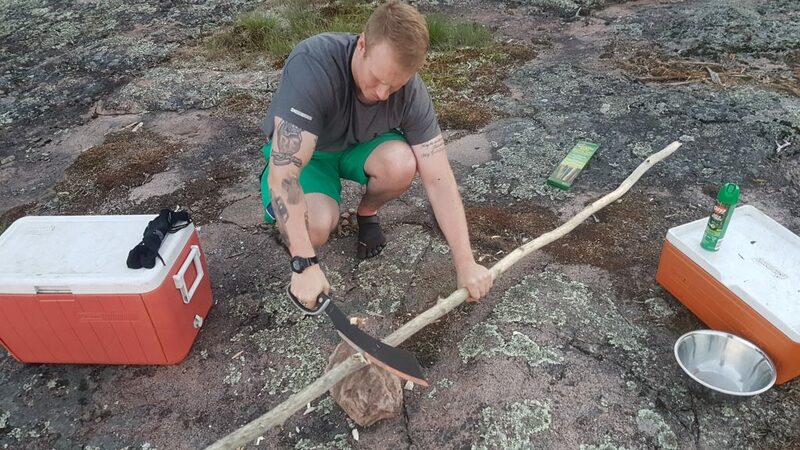 The initial portage from our parking spot to Meditation was a grueling 1.25 km, and to make matters worse the handle on my kayak broke halfway through. This made dragging it through the grass and gravel… well, a real drag. I’m no stranger to portaging, but with nothing but a length of webbing to pull with, it was tiring work. 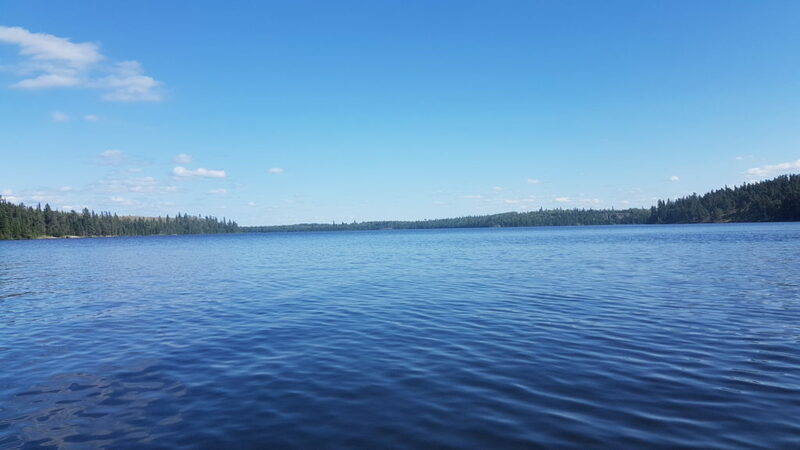 With a name like Meditation Lake, you would perhaps picture calm, relaxing waters. I know I did, and it was rather disappointing to reach the shoreline and find the wind blowing up large whitecaps all over the lake. We had no choice but to load up and paddle directly into the fray. Wind in our faces, waves crashing over our boats, we made it across the lake in decent enough time and portaged across to Horseshoe. 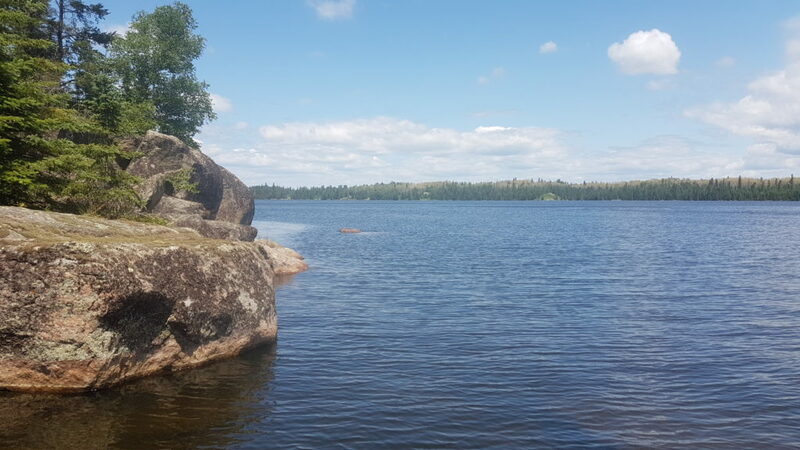 Like much of the Whiteshell, Horseshoe is a beautiful Canadian Shield lake. Rocky shorelines dotted with spruce, pine, and birch trees are broken up by imposing cliffs and ledges. 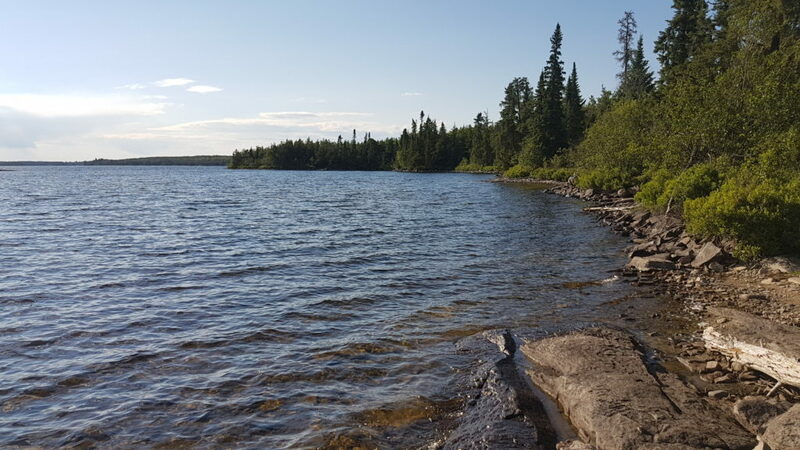 The water is clear and clean with a bottom made up of a mixture of sand flats, gravel, and boulder fields. 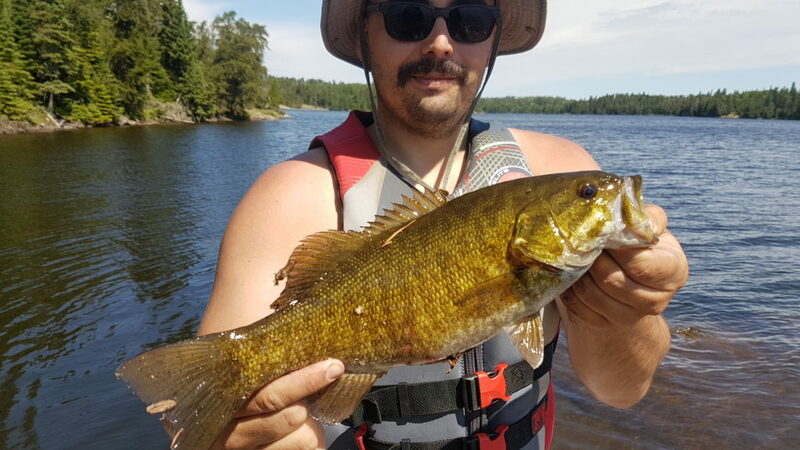 Perfect conditions for smallmouth bass. One of the first things I noticed as we arrived at the lake was the incredible amount of baby fish grouped up close to shore. There were schools of hundreds of fish visible at nearly every single shoreline that I came close to. 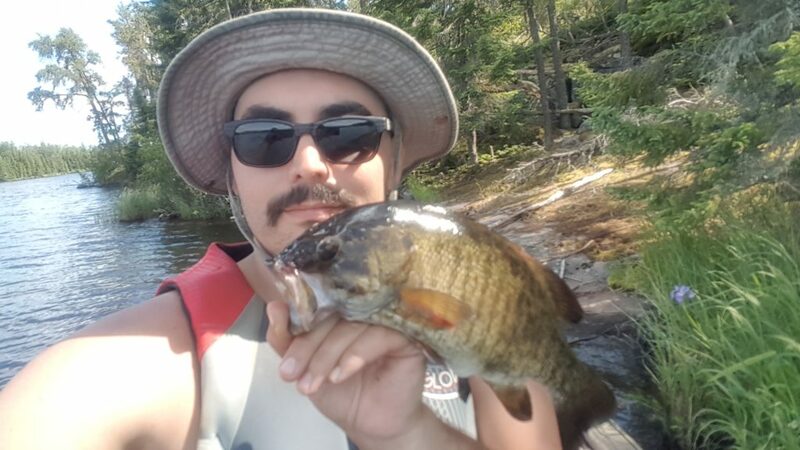 I am not entirely certain what type of fish they were, but I assume a mixture of perch and bass based on the coloration. Although I have seen young fish before, witnessing them in these thousands was a new experience for me, and something that will stick out from this trip for a long while. 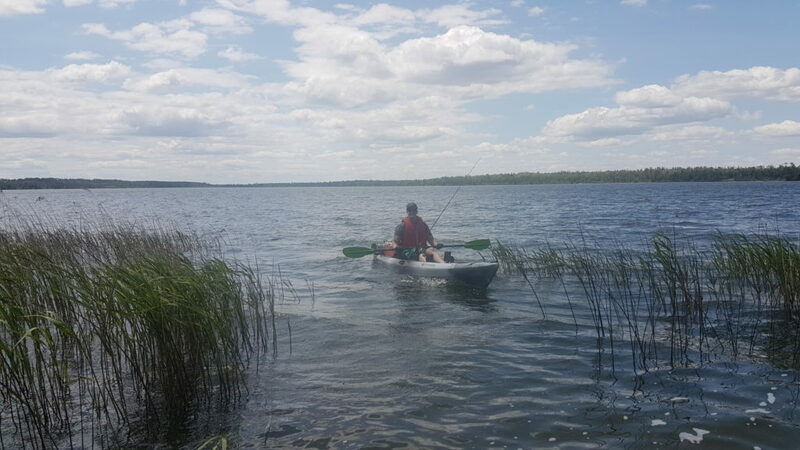 Aside from one other kayak fisher on his way out, and a couple others that passed by in the far distance, we had the lake to ourselves. It took us a little while to find the designated camp site, and when we did it was quite a let down. The site was small, with an old fire pit and nothing else. There was no latrine, table, or level ground to lay a tent. These are things I’ve just come to expect at any decent designated site. We abandoned that site and paddled down the shore until we found a much better option among the rocks. We set up our camp quickly and headed back out to get to fishing. It was slow going with very little action for most of the afternoon. Wind and the mayfly hatch made it hard to find the fish and harder to get them to bite on anything we were throwing. Success did come eventually though, and by the end of the day I had caught a few fish and one was decent enough to keep for dinner. Naturally, we couldn’t let the excess beer batter go to waste, and so we deep fried our smokies as well. Crazy? Maybe. Artery cloggin? 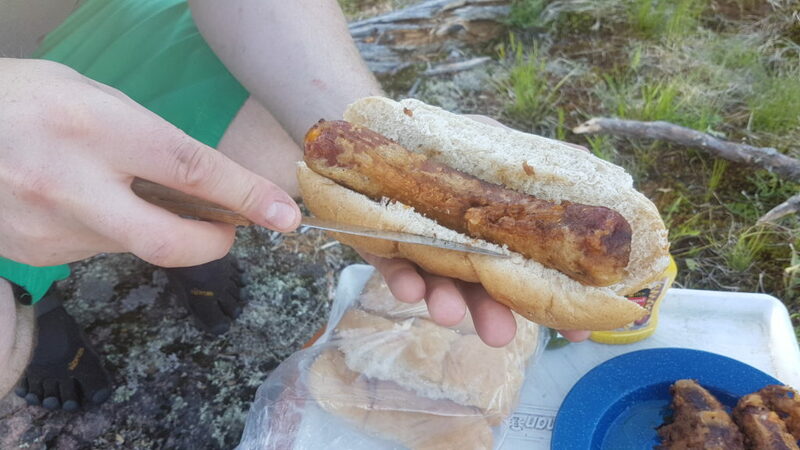 Certainly, however I can tell you it was delicious enough that I will likely never again cook smokies any other way while at camp. It was an excellent meal and the perfect way to end the day. Heart attack on a bun, delicious! With the fire dying down and the efforts of the day starting to hit us, we called it a night and headed to bed. 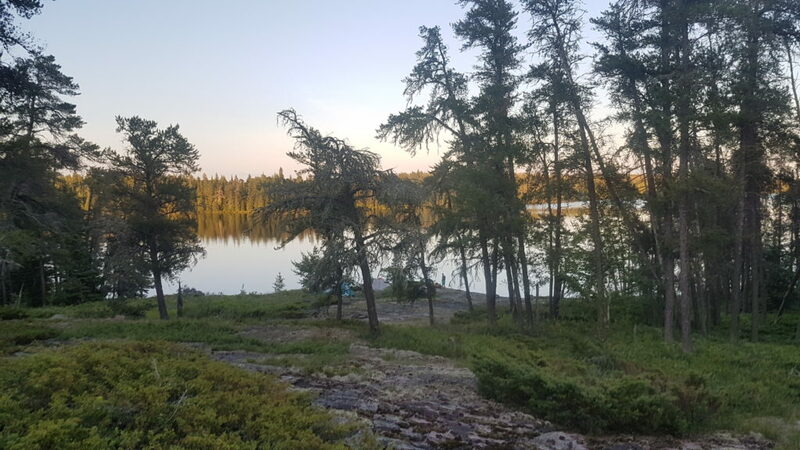 Falling asleep to the sound of fish feeding on the flies at the water’s surface, I had a very comfortable and undisturbed night. Morning rolled around and with it another sunny yet windy day. 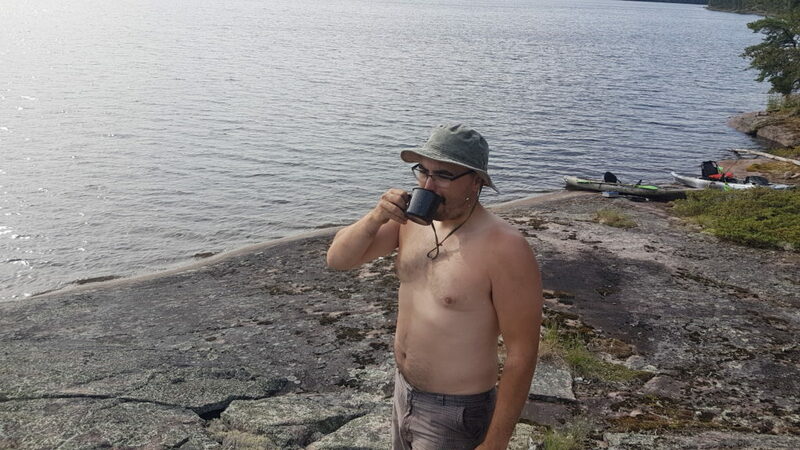 Coffee was made and chugged, camp was broken down, and we got ready to head back out. Originally, we were going to fish for the day and then come back for our gear when we were ready to leave the lake. We decided that we had packed light enough that we could just paddle around all day with everything loaded up. 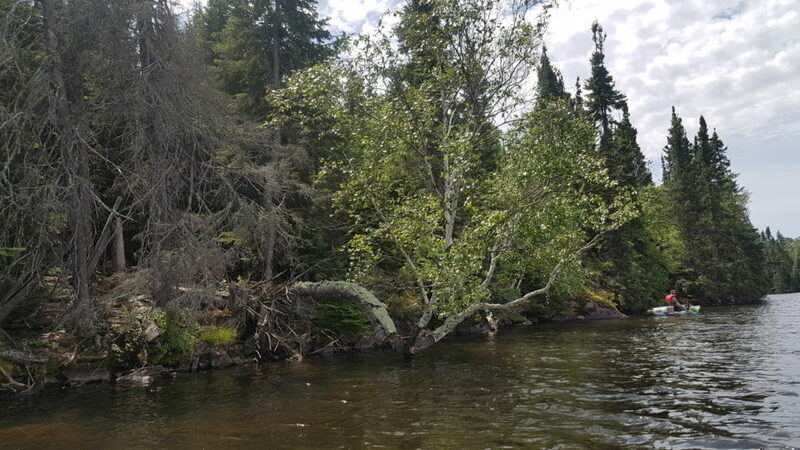 The plan was to fish our way back to the portage. This would let us go at a leisurely pace and skip having to come back to the campsite for anything. Getting anything to bite was just as hard the second day. 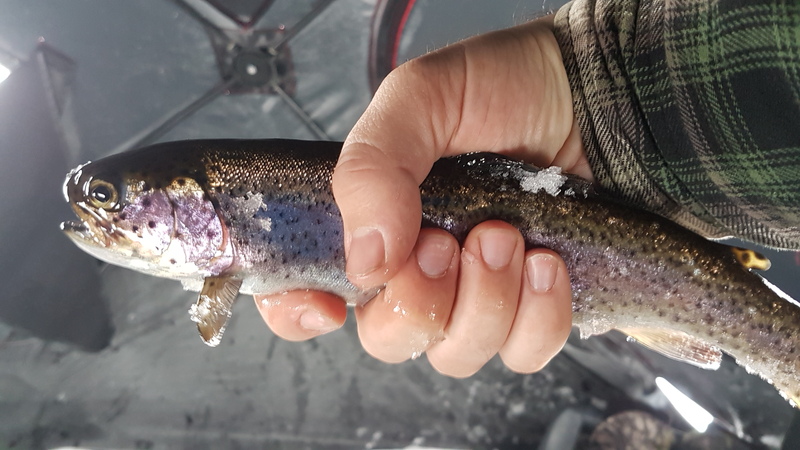 As we dialed in to where the fish were hanging out though, I started catching more. 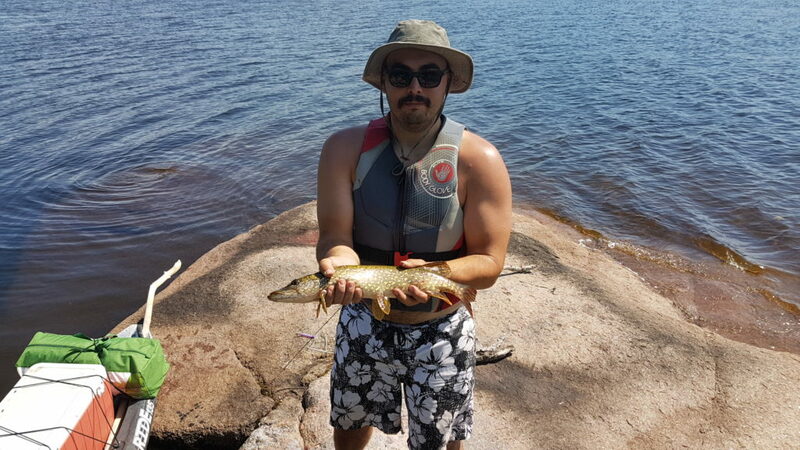 I pulled in a number of pike and bass. 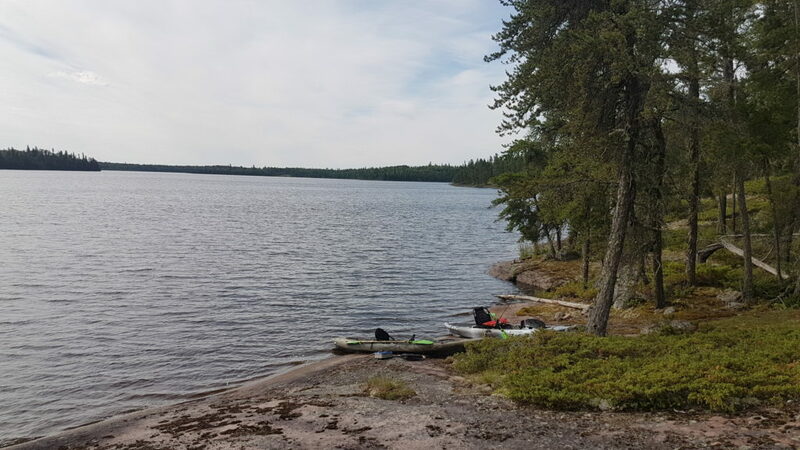 Before we knew it, the day had flown by and the portage back from Horseshoe Lake to Meditation was in front of us. I threw out one last cast, and caught one last bass before calling it a day. Horseshoe lake has a reputation as a great bass lake, and I certainly can’t say it’s not earned. Unfortunately, Brendon didn’t catch anything. 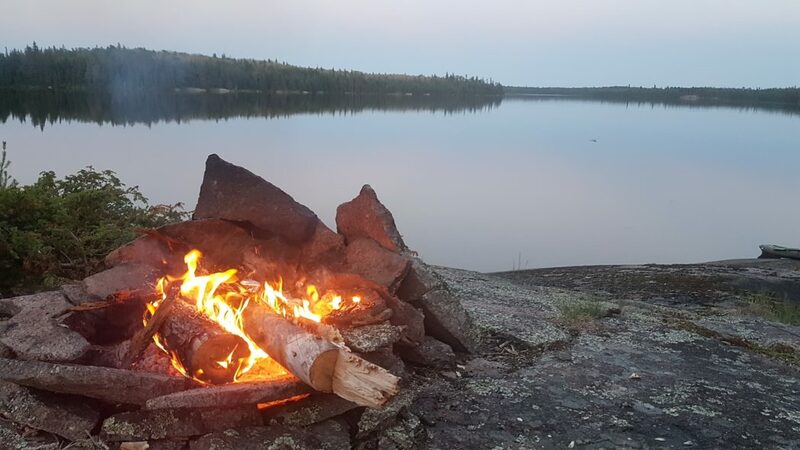 He assured me that he was mainly there for the camping and paddling, and was not all that concerned about fishing or catching anything. 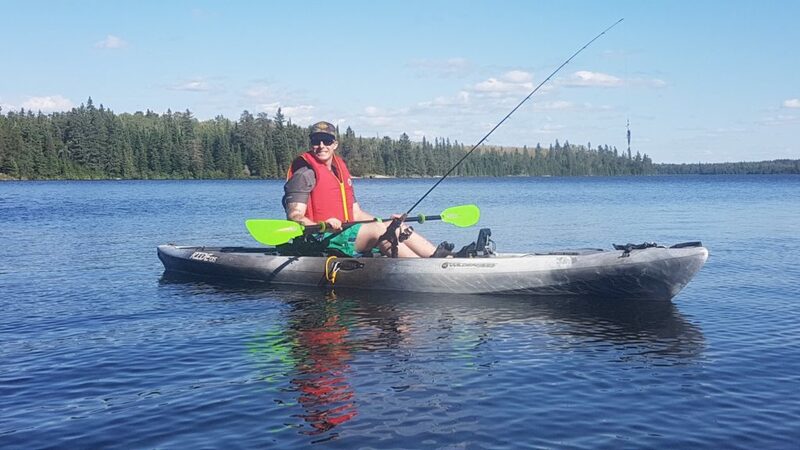 Having someone who actually enjoys the kayaking part of kayak fishing is a refreshing change. For most people I’ve taken out, the paddling is more of a necessary evil to get to fishing rather than something to enjoy in and of itself. 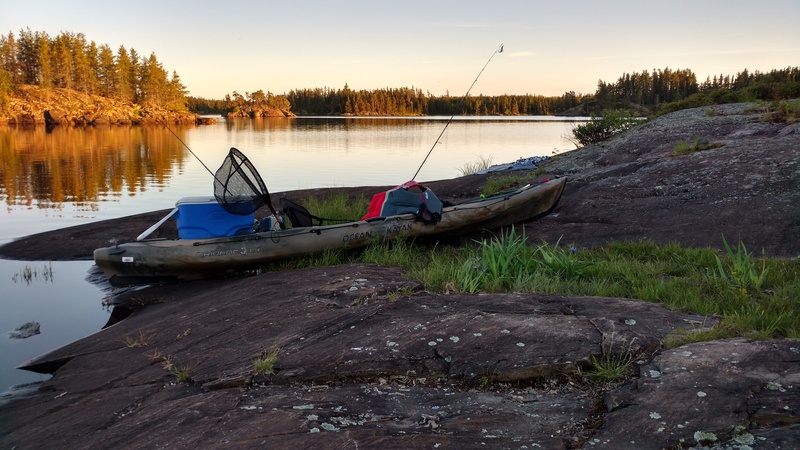 I always really enjoy the camping and paddling aspects of these trips just as much as catching fish. It’s nice to take along someone who looks at it in the same light. Crossing Meditation Lake on the way back was a chore. The wind was in our faces again, only much stronger. The waves were higher and it was often a struggle to make any progress against them. No wind was going to stop us from getting home though, and eventually we made it back across. Another long pull of the kayaks back to the parking lot and we were on our way back to civilization. 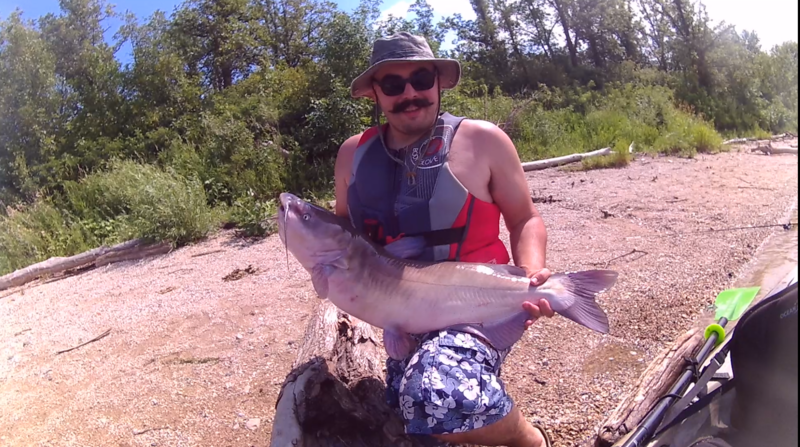 For being just an overnight trip, it was a lot of fun, and we packed in a lot of quality fishing time. 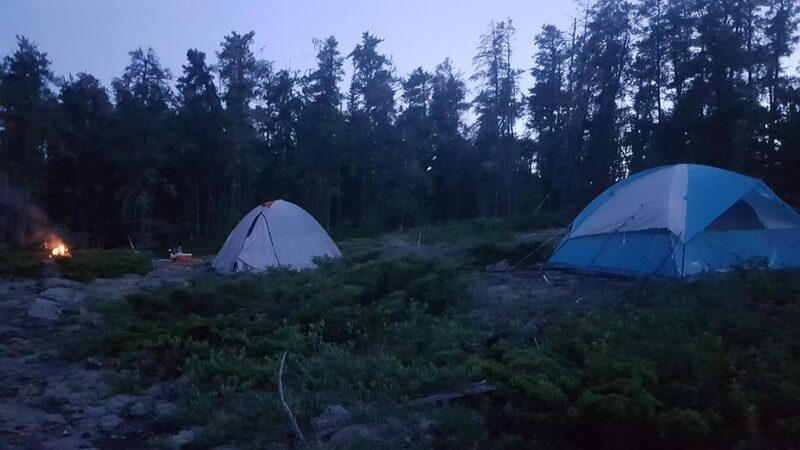 Camp was comfortable, the weather co-operated for the most part, and overall I really enjoyed myself. Brendon has already told me that we need to go camping again soon, so I can only assume that he did as well. 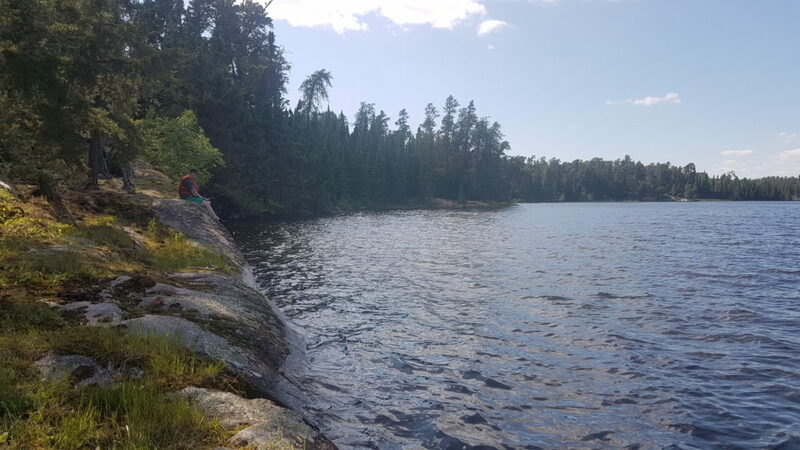 Horseshoe lake was a very nice lake and excellent example of the quality of the Whiteshell park’s backwoods areas. I will definitely be adding this one to the list of places to return to.